Oriented to the earth and incorporating existing trees in the area, Mantle combines four integrated spiral elements to create the shape of a Nautilus. 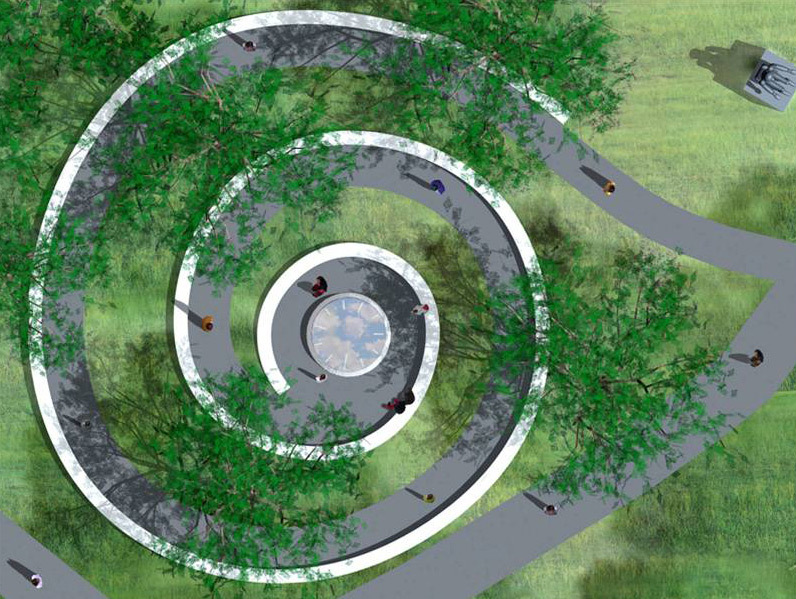 A five-foot wide winding footpath will follow the outline of the monument; rising from and returning to the earth. In addition to the path will be a continuous, smooth stone wall, which also serves as a bench. 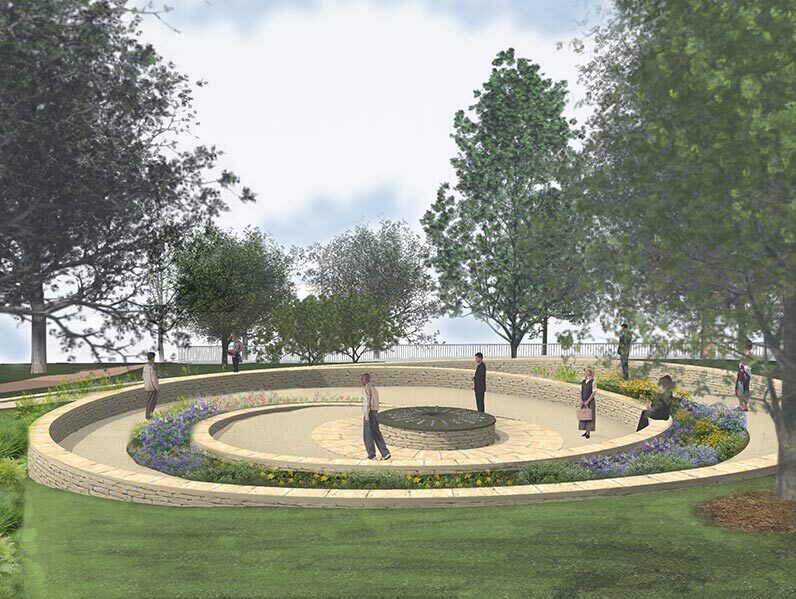 Natural landscaping throughout the monument will consist of a selection of perennial native plant species, including wildflowers. Mantle will be located in the southwest portion of the square, just north of the Bell Tower, with an eastern facing entrance. 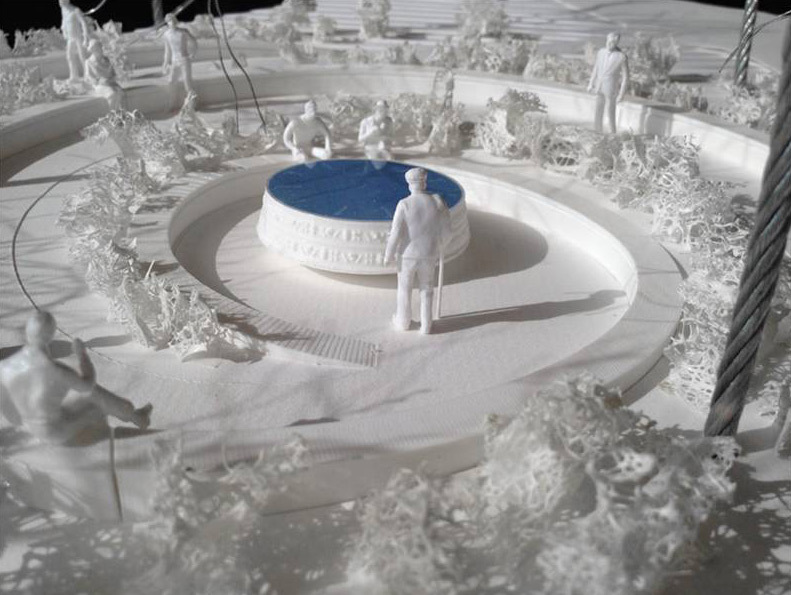 A meditation area, at the center of the spiral, will feature an infinity pool made to resemble the pottery indicative of Virginia tribes. The water within the pool reflects the river culture existing within these native tribes. Decorating the sides of the sculpture are frieze-like, life-size reliefs of corn, squash, and beans (the Three Sisters) as well as oyster shells from the Chesapeake and other objects significant to the region and its native inhabitants. Alan Michelson, a Mohawk member of Six Nations of the Grand River and an award winning artist has been commissioned to create Mantle. Michelson describes the monument saying, "[Mantle] requires the visitor to neither look up nor look down, but invites one to enter—from the east—and participate in it. It is not conceived as a static monument to be venerated but an active one to be experienced by moving off the everyday grid and into the American Indian circle". Tuesday, April 17, 2018 from 11:00 - 11:30 a.m. Rain or shine. No R.S.V.P. required. To determine and recommend to the General Assembly an appropriate monument in Capitol Square to commemorate the life, achievements, and legacy of American Indians in the Commonwealth. The Commission shall determine and recommend to the General Assembly an appropriate monument in Capitol Square to commemorate the life, achievements, and legacy of American Indians in the Commonwealth. The Commission shall seek private funding for the operation and support of the Commission and the erection of an appropriate monument. However, the costs of implementation of the Commission, its work, and the compensation and reimbursement of members shall be borne by the Commission from such private funds as it may acquire to cover the costs of its operation and work. All agencies of the Commonwealth shall provide assistance to the Commission, upon request. Until completion of the Commission's work or the erection of the monument, whichever occurs later, the Commission shall report annually the status of its work, including any findings and recommendations, to the General Assembly, beginning on December 1, 2009. The report shall also be posted on the General Assembly's website. © 2015-2019, Commonwealth of Virginia. All rights reserved. Designed and developed by DLAS.